Every now and then somebody will ask me to "rank the best rap artists/groups/deejays/etc. of all time" and send back an e-mail. When I compile these lists of hip-hop videos by year, I don't necessarily view them as a ranking exercise. I may start a list with the things I remember and love off the top, but I ultimately settled on the phrasing "Fifteen Important" to reflect the fact that each of the songs and their respective videos are equally valuable to me as a passionate hip-hop head. That said if somebody left me on a deserted island with a solar powered boombox and only five albums (and hopefully enough food to eat and fresh water to drink) it's a safe assumption that at least one of those five would be from The Roots. I'm not necessarily saying it has to be "Illadelph Halflife," but I'm not saying it would be a bad choice either. "Do You Want More?!!!??!" is the more acclaimed album out of their early catalogue of work, but there's a quiet cool confidence to "Halflife" that I've always appreciated. The Roots no longer had to prove they were great, it was already established, so now they could just settle into the groove and deliver slick hip-hop that seemed deceptively effortless but was incredibly polished and smooth. Few songs exemplify that aura of refined ease that the Philadelphians of Swing generated than the track "What They Do" and Black Thought's epithet "To emcee requires skills, I demand some shown." 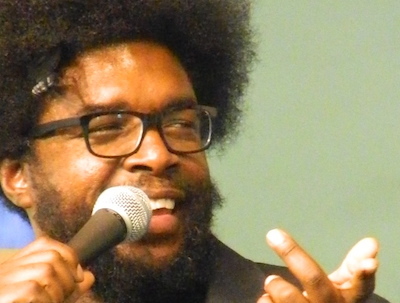 The video itself playfully mocks the ideas of hip-hop video cliches, from the honey shaking her booty behind Thought as he raps, to Questlove pouring himself a tall glass of champagne. "Livin the life of limos and lights" might be the order of the day for a famous artist, but you can see the comfort level of The Roots Crew hit epic highs when they're jamming in a smoky nightclub or standing on a street corner with their friends. It's about the music to them, not the image, and the video fires shots at the idea you have to be a conspicuous consumer to fit the rap mold of the day. Still Black Thought doesn't eschew capitalism, because he still wants it "made like Ed, nuff said" but he'll go "infinitely against the grain" to achieve it. When I tell you "What They Do" is my #1 video for 1996, it's definitely my personal favorite - but the cinematic "Elevators" and the spy movie thriller "Ready or Not" come close. 1.) The Roots - "What They Do"
2.) OutKast - "Elevators (Me & You)"
3.) The Fugees - "Ready or Not"
4.) 2Pac - "I Ain't Mad at Cha"
5.) Jay-Z - "Can't Knock the Hustle"
6.) A Tribe Called Quest - "1nce Again"
7.) Nas & Lauryn Hill - "If I Ruled the World (Imagine That)"
8.) Cypress Hill & Friends - "Throw Your Hands in the Air"
9.) Mobb Deep - "Give Up the Goods (Just Step)"
10.) Ghostface Killah - "All That I Got Is You"
11.) M.O.P. - "World Famous"
12.) Foxy Brown - "Get Me Home"
14.) Redman & K-Solo - "It's Like That (My Big Brother)"
15.) Dr. Octagon - "Blue Flowers"